Liam Bell is currently chairman of the National Gamekeepers’ Organisation. 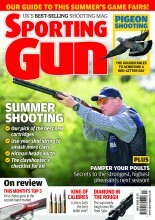 He also writes regularly for Shooting Times and runs the Millchope Park estate in Shropshire. What did you do before becoming a keeper? I went to school! I never really wanted to do anything else. I remember my father, who was a chemical engineer, saying I’d make a good gamekeeper when I was 10 or 11 years old. I found out what one did and was hooked. It sounded like a dream job, and it is. I already had a ferret or two, kept cage birds and bantams, reared ducks for the table and spent a lot of my time fishing – so I guess my father had an inkling. Did you do any formal training? I went on one of the first YTS (Youth Training Scheme) Gamekeeping courses, with a firm called Rural Pursuits – run by a guy named Robert Cottam, in Carmarthenshire. After a rather unsuccessful start with a poor headkeeper, I was placed with Roy Machin and his wife Evelyn on the Brogyntyn Estate on the Shropshire/Wales border. I had a great time, I was looked after like an adopted son and learnt a lot. Which piece of kit could you not live without? My wellingtons. Shropshire has quite high rain fall and I’d probably end up with trench foot if I didn’t have them. What’s your favourite time of year on the shoot? I like all times of year, but my favourite is probably spring, when everything is fresh and starting to wake up. First egg, first chicks, drilling the game crops – that sort of thing. I’ve not really had any. Well I’m not admitting to any, anyway! What’s your favourite type of shooting and why? I like all types of shooting. I think variety is the thing. No one wants to be doing the same thing every week. Changing venues and shooting different things is what makes it such an interesting sport. What advice would you give a young keeper? Stick at it. Don’t get despondent when things are going wrong, stay focussed and always give 100 per cent. If you do that you will stand out from the crowd, someone will notice you and that dream job offer will follow. The best advice I was ever given was to remember that the game I looked after belonged to my employer and not me. So many people forget this and end up in trouble when they start treating the game as their own. During your time as a keeper, which breed of dog have you found best as a working dog? Difficult question. I have spaniels for beating and dogging-in and use Labradors for retrieving, or if I need a peg-dog. I have always kept a terrier or two for foxing as well. As long as it is a good dog and does what you want, I don’t really think breed is that important. In your opinion, what’s the greatest threat to our sport, if any? The ministry of misinformation! So many people believe everything they see or read on social media. Shooting organisations like the NGO are doing a great job defending our sport and will continue to do so. Tell us about the best dog you’ve ever had. I’ve been lucky and had several good ones. A terrier called Meg, who would stay to ground until you dug to her no matter how long it took. A cocker dog called Snuff, who would destroy cover, was 100 per cent honest and would work until he dropped. A couple of Labradors including an old one I’ve got in the kennel now, who was fearless in water and a fantastic retriever. A dog that could take a line and find a runner when everyone else had given up and moved on. What’s your favourite shotgun and why? I use different guns/rifles for different things and don’t really have a favourite. If I had to choose it would be the single-barrel .410 that I bought brand new for £60 in the early 80s. Just handling it brings back so many great memories. I have passed it on to my eldest son (who is also a keeper) and he is as taken with it as I am. Fishing, when I get the time, and following the rugby. I love the six-nations and being a Welshman (who lives in England) I get more than my fair share of flack if we lose. Having said that I do crow a little when we win! Which do you prefer, wellies or lace-up boots? Wellies when wet, boots when dry. No preference really. Wellies are easier to get on and keep clean. Boots are comfier and better on the feet. Gamekeepers: From long hours to relentless predators, there are many aspects to a gamekeeper's job description.